Thanks for useful information as to new HLT Magazine design and features. In Language Teaching, lexicogrammatically to humanize? A new Word Class let´s creatively devise. by those words, POSITIVENESS would be sown. to cooperate, to educate; to advance, to enhance. In her latest blogposther latest blogpost, the results of Chia Suan Chong's crowdsourcing question on social media got her thinking about language and how we see the world. If there is a lesson to be learnt from Google translate, it is that languages are not simply mirror images of each other. The words and expressions in one language may not find an equivalent in a different one, and the concepts expressed in one language might not exist in another. In this week's complimentary online article, Paul Carr has several suggestions for when and how to correct errors. I feel that error correction is of fundamental importance. I believe that is just as important to correct errors made by younger students as it is to correct those made by adults, and this is something that the students themselves, their parents and group leaders all expect. However, your ideas need to be varied enough to make mistakes memorable and to avoid repetition. Younger students often don’t have the necessary academic experience to know what works for them and what different options are available. That is why it is so important for you, the teacher, to act as a guide. The more prepared you are to deal with errors and the more techniques and activities you have at their disposal, the more your students will benefit. Sometimes we are faced with the challenge of getting a student on our side so that they enhance instead of disrupt the classroom dynamics. In her latest blogpost, Chia Suan Chong looks at five ways that could help us do so in the first part of this two-part blog series. Aoife McLoughlin outlines 7 difficulties with large classes as well as 7 tips that can help you manage with ever-growing class sizes. Teaching large classes is an area that continues to receive little or no training on formally-recognised initial teacher training courses and, until we’re thrown in at the deep end, it’s not something we are ever really prepared for, but hopefully these tips and techniques will help you in your teaching... before you reach burnout! Who’s afraid of transparent teaching? Who likes being observed? What are the benefits? In this featured article from our latest issue of Modern English Teacher, Stephen Reilly discusses ways of making lesson observation more interesting and useful. Most workers are happy to be seen working. Indeed, on my daily walk to the teaching centre I see street cleaners sweeping, bakers kneading dough and newspaper vendors selling and none of them has ever said to me ‘don’t watch’. Unfortunately, I can’t make the same claim for my colleagues or myself. In the case of teachers, this entails throwing the doors and windows of our classes open to show and broadcast our lessons to whomever wishes to watch. We would then become less fearful and subsequently more receptive to others’ requests to see us at work. What follows below are ten means of achieving transparent teaching and what we gain by putting them into practice. 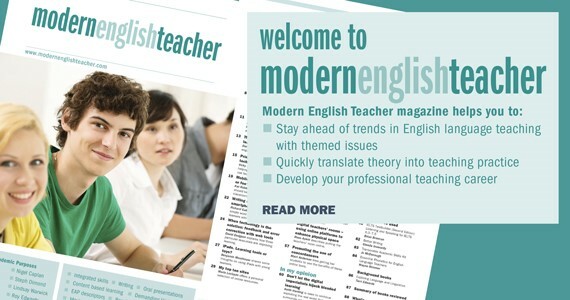 Modern English Teacher articles are only available to MET subscribers. If your subscription is about to expire or you are not yet a member, you can subscribe from as little as £31 per year. In the final part of this blog series, Chia Suan Chong considers how we can get to know our students and understand them better when dealing with challenging behaviour. In this week's complimentary online article, Beth Davies and Nicholas Northall offer ten top tips to those new to the teacher trainer role. 'No one told me that!' is a new series of articles in which we aim to provide some much-needed continuing professional development (CPD) for novice teacher trainers. The articles in this series are primarily aimed at teacher trainers with under two years’ experience, and we hope that you will find our tips and advice useful, whatever your teacher education context. Over the next few issues, we will look at a number of areas integral to the role, namely designing and delivering input sessions, supporting trainees with lesson planning, observing lessons and giving feedback and, finally, coping with the numerous pastoral issues a teacher trainer may have to face. Other English Teaching professional articles are only available to ETp subscribers. If your subscription is about to expire or you are not yet a member, you can subscribe from as little as £31 per year and receive 6 magazine issues, MyCPD (online professional development tracker) as well as instant access to the digital editions and an extensive digital library.